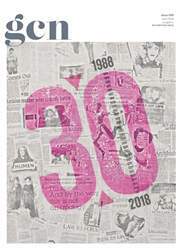 Charting 30 years of the evolution of LGBT Ireland through the stories that appeared in these pages. The civil service is to ban discrimination on the grounds of sexual orientation, becoming one of the first employers in the State to do so. Both houses of the Oireachtas have for the first time passed a measure granting rights to homosexuals. The measure was required to enable the Government to ratify the UN Covenant on Civil and Political Rights. It is now an offence to incite hatred on account of race, colour, religion, ethnic or national origin, membership of the traveler community or sexual orientation. Stories From The Silence, an Irish-made documentary about people living with HIV/AIDS had its first showing and launch on May 16 at the Riverside Centre, Dublin. This Irish first was produced jointly by the AIDS Action Alliance and the Irish Family Planning Association. The first Irish Lesbian and Gay Film Festival will take place in Cork on the weekend of October 11 to 13. A collaboration between the established Cork Film Festival and the newly-opened resource centre, The Other Place, it promises to bring together the best in international lesbian and gay cinema and to provide a forum for interested Irish filmmakers to air their views. Ireland’s lesbian arts festival, aLAF ran from 2002 to 2004, becoming one of the biggest queer cultural events on the calendar. It started over pints in a Dublin pub, where a few friends were talking about the dearth of opportunities for lesbian artists to exhibit their wares. The festival ran for four days each year, and it had an international presence. “That was one of our aims at the start,” aLAF committee member, Iris Elliott told GCN in 2003, “to not have just more Irish artists but artists from all over the world too.” aLAF was briefly revived in 2009, becoming dLAF, the Dublin Lesbian Arts Festival. The Oireachtas must introduce new legislation following the Norris decision by the European Court in Strasbourg. GLEN calls on the Oireachtas to introduce full civil rights for all lesbian and gay citizens in Ireland. When the governing body of UCC voted 13 to seven to recognise the college’s Lesbian and Gay Support Group, it became the first constituent college of the National University of Ireland to accept a lesbian and gay group as a legitimate student society.